GE Apex Pro CH Telemetry Transmitter ECG Plug Block & Flex Assembly New Warranty - NTGE9222 Precio: 149.99 Brand new and ready for installation, one GE Apex Pro CH telemetry transmitter ECG plug block and flex assembly. Compatible with the GE Apex Pro CH line of telemetry transmitter devices. If you have any compatibility related or other questions, please let us know! 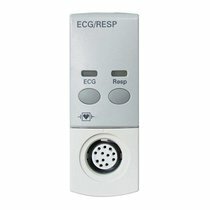 This new ECG block is backed by our 1 month warranty!